FORTUNE’S FAVORS, the third and final installment of the Nyx Fortuna series releases Tuesday, August 12th! The fight for the world has begun, and only the fates can stop hell from being unleashed. To save his cousin Claire, Nyx Fortuna was forced to release the goddess Hecate. Free and bent on destroying the world, Hecate will kill anyone that gets in her way… starting with every member of the Wyrd family. If you are new to the Nyx Fortuna series, be sure to check out STRANGE FATES and DARK DESCENT! DARK DESCENT, book two in Marlene Perez’s Nyx Fortuna series, launches this week! If you enjoyed Nyx’s wry humor and non-stop action life, you will love what Perez has in store for you next. Nyx, still reeling from Elizabeth’s betrayal, has no time to rest. His cousin Claire has gone missing and his aunts, the three Fates, are threatening that if he doesn’t find her, Elizabeth will suffer. Now, despite how he may feel, Nyx must venture into the underworld of Minneapolis to find his wayward cousin, lost to the thrall of Hecate’s dark magic. But releasing Claire is not without its consequences. While it might fulfill the prophecy foretelling the fall of the Fates that have plagued him for so long, it would also mean releasing Hecate from her dark prison… and into our world. Nyx must now decide. How far would he go to save the woman he loves…. the woman who betrayed him? To start from the beginning of this awesome series, check out STRANGE FATES and read an excerpt here. Greek myth and forbidden romance meet in this exciting new urban fantasy by Marlene Perez. STRANGE FATES is a hot, new series for adult readers which follows the perilous journey of Nyx Fortuna – an immortal with a serious bone to pick with fate. Read the first chapter here or check out this interview with the author to find out more about the mythology and how Marlene transitioned from writing YA to adult fiction. Strange Fates is a departure from your YA works. Even though he looks like he’s twenty, Nyx is already several centuries years old. What made you decide to write from the POV of an older protagonist? I was interested in a different take on an immortal. They’re often written as wiser and all-knowing, but in my experience, more years on the planet doesn’t necessarily make you any wiser/better, especially if you haven’t dealt with your issues. Nyx has definite issues he hasn’t dealt with. He also has a bit of a drinking problem and addiction slows or stops emotional growth. He’ll grow throughout the novels, but it will be slow and painful. What has the transition been like switching from YA to adult urban fantasy? Did you change your writing process at all? My writing process usually starts with me finding some little gem of information somewhere and then huddling over it like Gollum did with the ring, muttering “my precious” and hoarding it, waiting for the right time/right book to use it in. I wasn’t trying to write from a male point of view, but Nyx just started talking to me. He was a little drunk at the time and I knew I had to start Strange Fates in a bar. 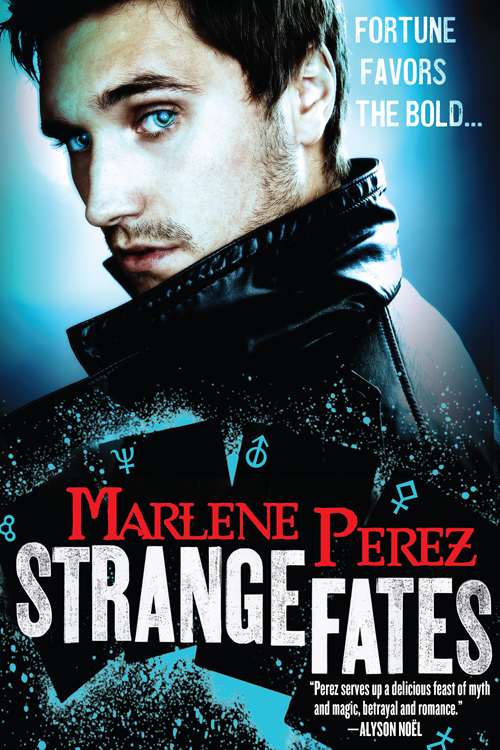 I am extremely excited to announce the publication of STRANGE FATES by Marlene Perez, out today as an Orbit e-only original! This is Marlene’s first foray into the adult urban fantasy realm, and with its fast pace, forbidden romance, and unique mix of Greek mythology and Fates, you will not be able to put it down. About STRANGE FATES: Brooding, leather jacket-wearing Nyx Fortuna looks like a 20-something, and has for centuries now. As the son of the forgotten fourth Fate, Lady Fortuna, he has been hunted his entire life by the three Sisters of Fate that murdered his mother. Fed up and out for revenge, Nyx comes to Minneapolis following a tip that his aunts have set up a business there. His goal– ­to bring down his mother’s killers and retrieve the thread of fate that has trapped him in the body of a twenty year old unable to age or die. But when a chance meeting with the mysterious, dangerous and very mortal Elizabeth Abernathy throws off his plans, he must reconcile his humanity and his immortality. Also, check out the book trailer on USAToday’s Happy Ever After blog.